"What are the dimensions of the panels in the 737 overhead"
I haven't found an easy summary of measurements of each of the Boeing 737 modules, so I put together the best information I've been able to find. The vertical dimensions are based on the DZUS-rails that mount these modules. The centers of the holes in the Dzus rails are 3/8" separated from each other, therefore the panel heights are mutiples of 3/8". The width of the backplate is 5.75" (5-3/4" or approx 146.05 mm). The aluminum backplate thickness is 1/16". All plates need to be trimmed a little (say 1/64") to allow easier fitting. The clearance opening between rails seems to be 5.07" based on DFCI (was DZUS) documentation. CPFlight modules use a 4.92" (125 mm) width for equipment behind the front of the panel. 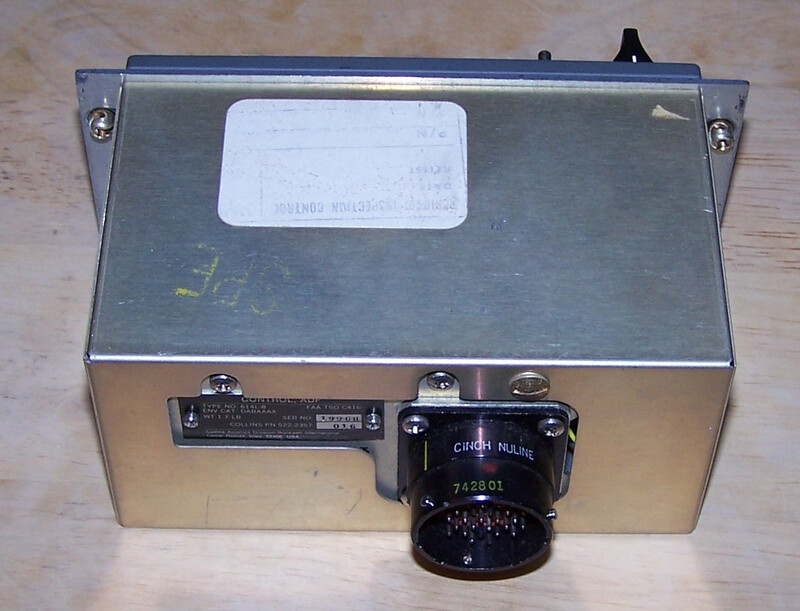 To confirm the measurements, I purchased a Collins ADF module (the cheapest module I could find on ebay). The width measures 5-3/4" minus maybe 1/64"
The horizontal spacing of the mounting bolts is 5-3/8". The vertical spacing of the mounting bolts is 1-1/2" (1.5 / .375 = 4 DZUS units). The width of the box behind the panel is about 4-31/32". This fits within the 5.07" panel opening documented above. The height of the box behind the panel is about 2-15/32". The design I will use for the mounting rails is shown below and consists of 1/16" x 1" aluminum flat bars and 1/4" x 1/4" square aluminum bars. This design provides the correct overall spacing, the correct mounting hole spacing, and the correct opening to fit the modules. PC Flights sells 8-32 screws that look like the DZUS mounting bolts and will fit this design nicely EXCEPT they are a little large. Therefore I had to add 1 third piece or 1/16" aluminum between sections to compensate. 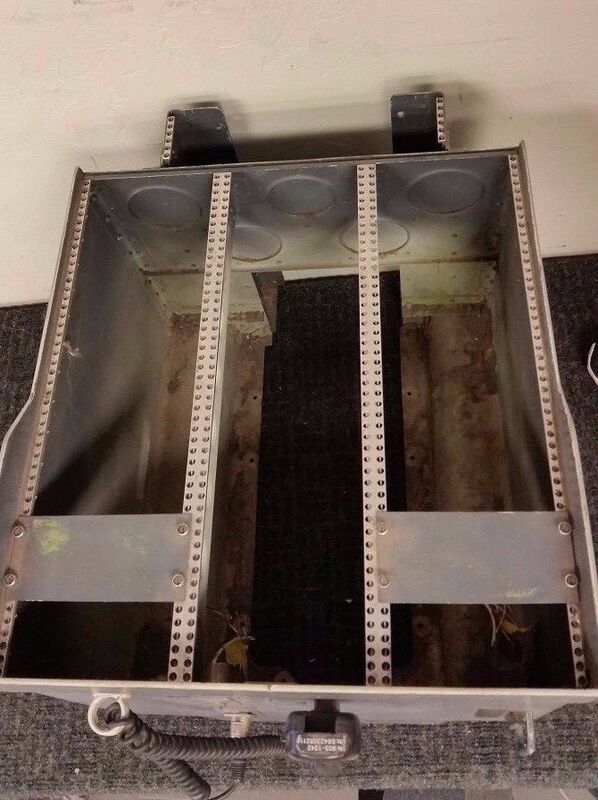 The overall panel height for the Forward Overhead, Aft Overhead and Pedestal panels is based on counting the mounting holes in actual frames sold on ebay. 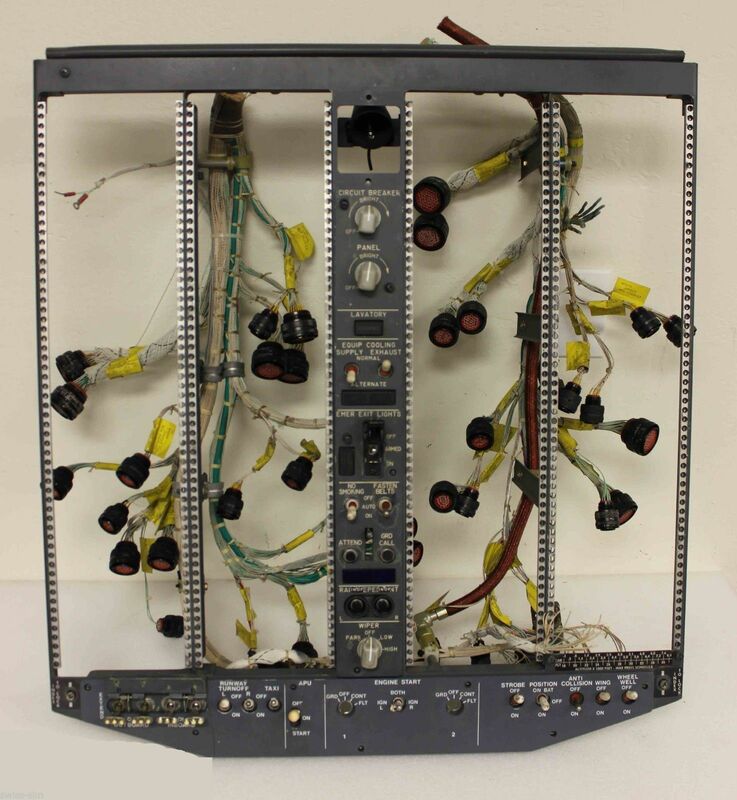 Use of any of the simulator equipment suppliers panels will provide a good looking overhead and pedestal area in your simulator. I used PC Flights for the Forward Overhead panel since they seemed more accurate and were in the USA. I used HISPA for the rest since they seemed to be the least expensive and had the items PC Flights lacked. I'm curious to know if I can modify the modules I have to more closely match the original designs, and the following describes my results. Sismo Solutiones and PC Flights seem to have the most accurate sizes. The total Forward Overhead module height is 590 mm which agrees with the measured frame. A few modules do not meet the DZUS standard but most do. I don't know about the mounting hole dimensions. They also dropped some of their prices. Sismo, Hispa, and Open Cockpits provide systems, meaning they also supply hardware and software to connect the panels to the flight simulator software (primarily FSX, little support for X-Plane) as well as the MIP, MCP and EFIS panels. PC Flights also has the interface hardware and software (Supplied by Sismo) but is missing the Aft Overhead as well as the MIP, MCP and EFIS panels. 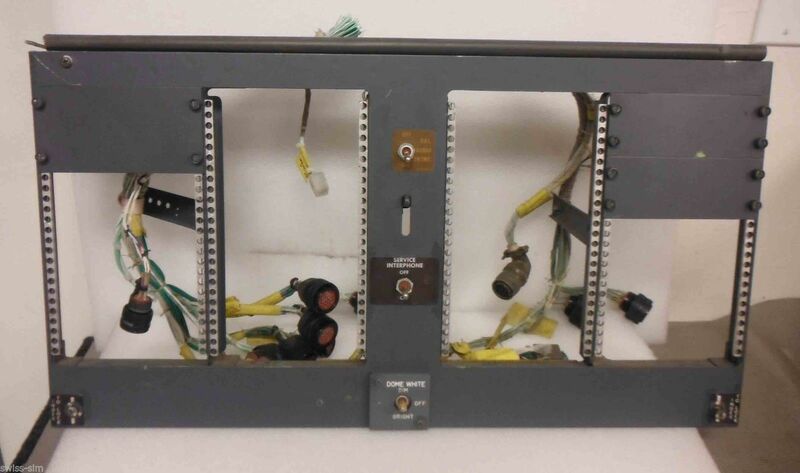 CockpitSimParts has the MIP, MCP and EFIS panels, but not the interface electronics. Hispa primarily uses the smaller toggle switches for its panels, the other suppliers use the larger toggle switches for all their panels. Hispa Panels only uses 564 mm for the Forward Overhead height. This requires distorting some of the module heights. They are also constrained by their meter designs. 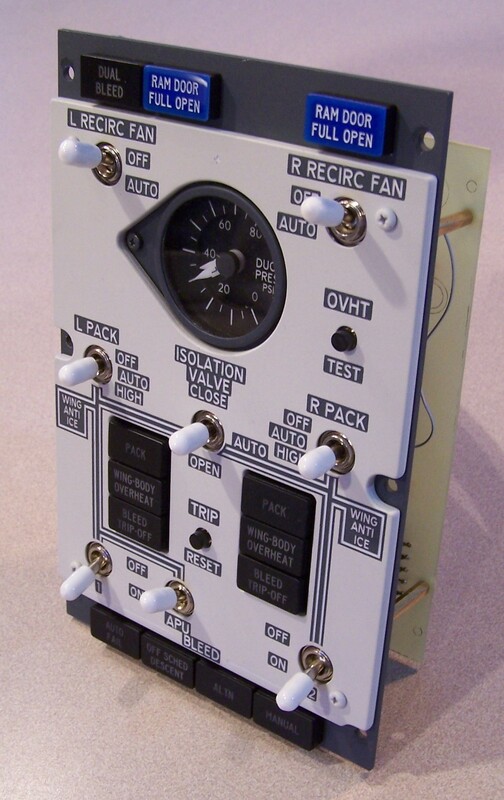 CockpitSimParts.UK and FlightSimulatorParts seem to be the same since their module sizes are identical and are both missing the Cabin Pressure and Voice Recorder modules. They both use 150 mm as the module width (not 146). They also both misspell the Bleed Air Panel "Neumatic". OpenCockpits does sell modules but nothing seems to be published about sizes. PC Flights is new and still adding panels to their product line (as of 2017). All mounting plates will be 1/16" aluminum (or 1/8" acrylic). One advantage is that the plates can be tapped for mounting the acrylic front plates without interfering with the mounting rails. The enclosing box uses 4- or 6- 1/4" square aluminum rod drilled and tapped at either end for 4/40 screws. The back plate bolts onto these rods. Side plates are cut out of 1/32" aluminum and bolted to these rods using 4/40 flat-head screws. Each design will include the artwork for pcb backplates using headers for connecting the controls/annunciators to the outside electronics. However, initially I will use an aluminum back plate with 2 circular connectors to more realistically model each actual module. This is pricey, so I may change my mind. These housings need pins, which is where most of the expense is.